Emerald AACE 2017 was established during 5 days face to face class with two main targets: (1) pass AACE/PMP/GPC Certification exam at first attempt and (2) gain Return of Training Investment (RoTI). After face to face class, team will do distance learning mode (DLM) for 180 days. 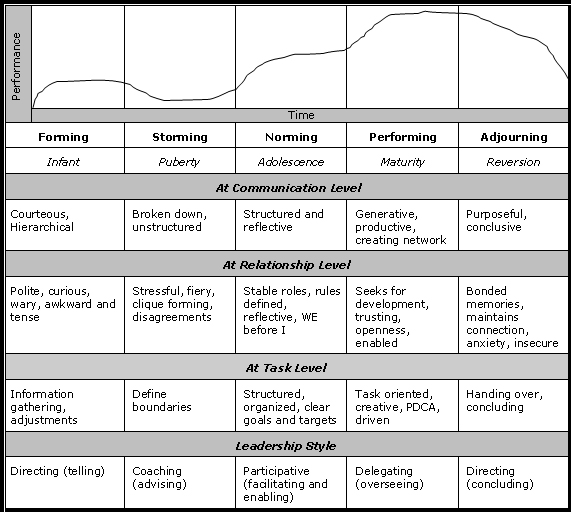 The first assignment of DLM is to assess the team development stage using Tuckman Model. From there we can analyze what leadership style can be effectively implemented. In 1965, Tuckman published his Forming Storming Norming Performing model and completed with the fifth stage, Adjourning in 1970s. This model explains that as the team develops maturity and ability, relationships establish, and the leader changes leadership style from Directing (Telling), Coaching, Participative, and Delegating up to Directing (Concluding) . To determine current Emerald AACE 2017 team stage, each individual in team fill the excel format of Tuckman Survey Scoring Template. Table.1 – Individual responses from the Tuckman Survey Scoring Template. Based on the above individual’s response, PERT analysis was performed to identify team behavior at P70 because there are differences in team perception. Based on Table 2, we can conclude team is in Performing stage (indicated by the rank). The team has successful performance, flexible, task roles and helpfulness each other. Style of leadership this stage is “DELEGATING” mode where some leadership is shared by the team. There is only a small difference score result between each phase, this indicates that team has no clear perception of the way your team operates. The team’s performance is highly variable indicate from scattered highest point on each individual (see Table 1). It means the team phase is Storming. Leadership style that should be use is selling or consulting to guide team focus on objective, avoiding friction and emotional issues. Team assessment should conduct periodically in two months ahead to capture team phase changing and select appropriate style of leadership, this evaluation can help the team to improve coordination and productivity.